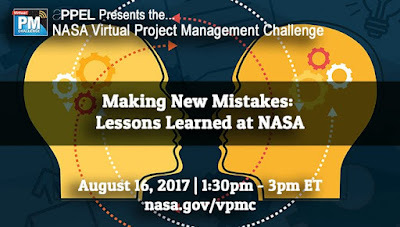 I'll be joining NASA colleagues Michael Bell of Kennedy Space Center and Jennifer Stevens of Marshall Space Flight Center to talk about how NASA addresses lessons learned. My focus at the Goddard Space Flight Center has been working with projects to institutionalize group reflection activities such as the Pause and Learn as a way of facilitating group learning and documenting lessons for dissemination, focusing on knowledge flows and learning rather than lessons in a database. This webinar is open to the public and there should be time for Q&A. What? You missed it. You can catch up here.